Mozilla is changing the way Firefox loads third party plugins such as Flash, Java and Silverlight. This change will help increase Firefox performance and stability, and provide significant security benefits, while at the same time providing more control over plugins to our users. Users should have the choice of what software and plugins run on their machine. Click to Play allows users to easily choose if they wish to run a plugin on a particular site. Users can also configure sites to never run plugins or conversely always run plugins. This change puts the user in control. Poorly designed third party plugins are the number one cause of crashes in Firefox and can severely degrade a user’s experience on the Web. This is often seen in pauses while plugins are loaded and unloaded, high memory usage while browsing, and many unexpected crashes of Firefox. By only activating plugins that the user desires to load, we’re helping eliminate pauses, crashes and other consequences of unwanted plugins. In addition to the security benefits provided by Click to Play Mozilla also strongly recommends that users keep their plugins up to date. The following website can be used to determine if plugins are current. Our plan is to enable Click to Play for all versions of all plugins except the current version of Flash. 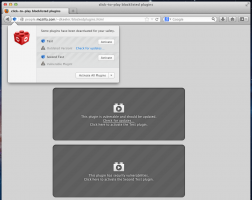 Click to Play has already been enabled for many plugins that pose significant security or stability risks to our users. This includes vulnerable and outdated versions of Silverlight, Adobe Reader, and Java. 1. Click to Play old versions of Flash (versions <=10.2. *) and slowly add more recent insecure Flash versions to the Click to Play list. Note: The most current version of Flash will NOT have Click To Play. 2. Click to Play current versions of Silverlight, Java, and Acrobat Reader and all versions of all other Plugins. During this change we will monitor the results and feedback of the new settings and UI to ensure we’re providing a quality experience and delivering the many benefits of Click to Play to Firefox users. I am, personally, glad for you opting to “click-to-play” for security issues with plugins. This gives users a choice that should be a users. Enterprise use for FF on OSX. I need to be able to use my Office plugins (Sharepoint, Lync) and Silverlight on all of our domain’s intranet web sites. It seems rather pointless from a security standpoint to turn off plugins, but globally allow flash… it’s the largest threat vector for drive by downloads on Windows systems we see.